I have no idea how this is playing out in the national media. 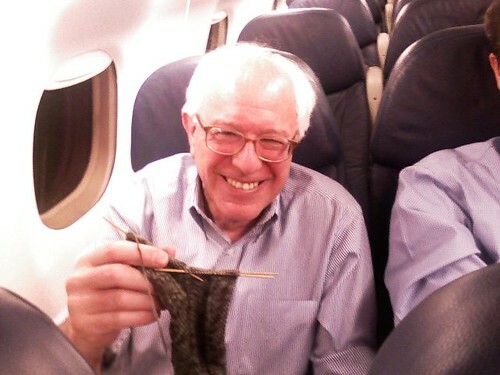 But I just wanted to speak up as a voice from Vermont – a short thing about Bernie Sanders. He’s been representing Vermont for as long as I’ve lived here. And if we have any chance of getting the money out of politics, I think he’ll find it. Can we all agree that would be a good thing? And if you’ve been around here for awhile you’ll know I’d also be really happy to have a politician or two who could talk seriously about climate change. But don’t worry, this isn’t all going to be political. Let’s get back on the topic of knitting – shall we? 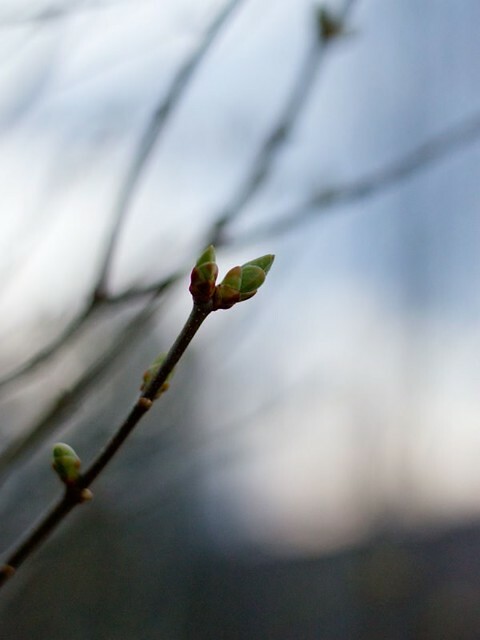 I love this blog as a means of telling stories. I can show you the behind the scenes process of writing a book, developing a new pattern, or even just the week by week growth of my veggie garden. But for the times that I have trouble sitting down and writing a blog post there are other options! If you want to know what I’m up to in quick sound bites, I’m on twitter as BeckyinVT. If you want to SEE what I’m up to, instead of reading it, you can also follow me on Instagram – also as BeckyinVT. 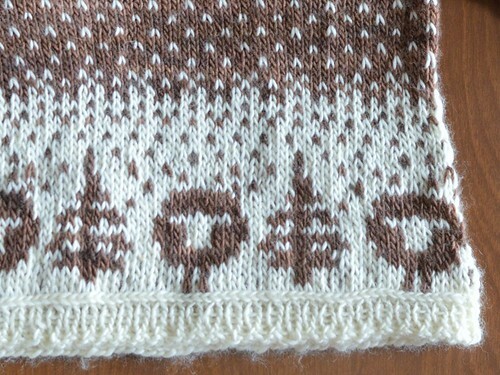 And of course, if you want to see what I’m knitting right now, look me up on Ravelry. Of course I’m BeckyinVT there too! For the last two weekends I’ve carefully baked a pie. Starting with the same recipe each time; I carefully adjust the amounts of every ingredient. I’ve made up plenty of recipes in the past. 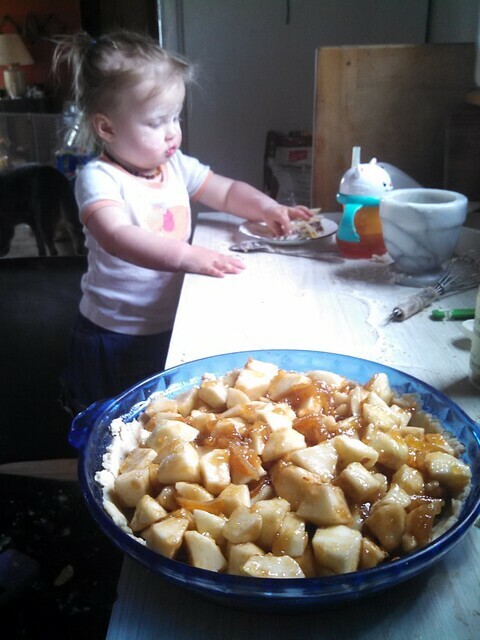 And while we were writing the book I tested several of Calley’s finished recipes. But this is the first time I’ve approached the development as methodically as this. 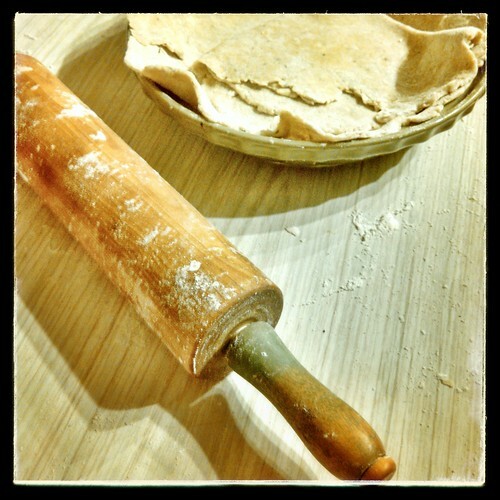 I’m perfecting this pie recipe for publication! I’ll let you in on the details, eventually. This is Anders. 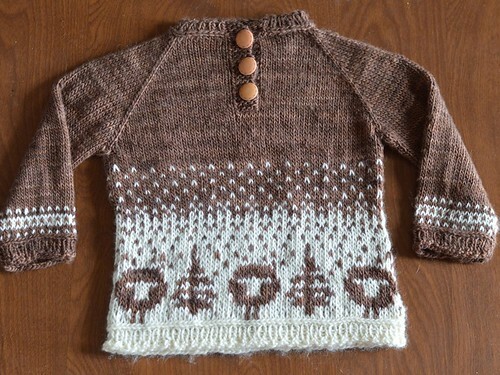 It’s the little brown and white baby sweater I was knitting from Mrs. Crosby Play’s yarn. It was gifted to the new mom-to-be two weekends ago, so I’m happy to finally have the pictures uploaded! This is a really well written pattern. I buy a lot of PDFs to see how other designers do their thing. This one has a layout that makes me wish I had time to re-do all my own patterns. Not that THAT is likely to happen any time soon. It was also my first experience with the Vikkel braid – the horizontal line of stitches around the hems. It’s cute, and not really hard at all! A great finishing touch. Oh yeah, and the sheep. 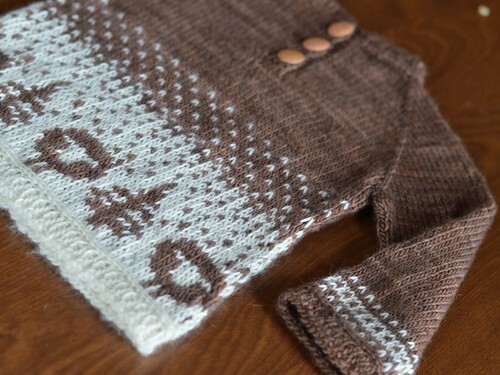 This new mom is also a knitter, so I wanted to put something sheepy into the pattern. The Anders design includes just the tree chart, but I added the sheepies. I always have to modify something, apparently. 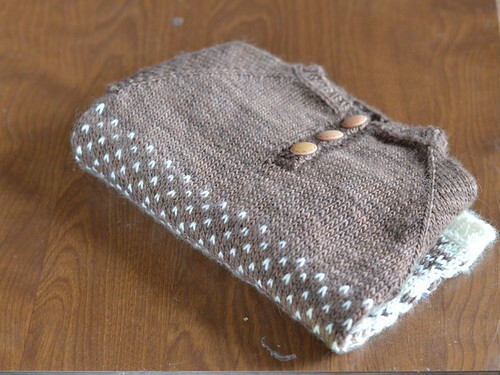 Check out my project on Ravelry to see more details.